For more than 20 years, Maitre ‘D has been the undisputed leader in point of sale (POS) and management systems throughout the restaurant & bar industry. This Quebec-made software offers a full range of state-of-the-art applications that can be customized according to your specific business needs. With more than 20,000 customers around the world for over 30 years, Maitre’D software offers a complete, efficient and flexible point-of-sale solution to restaurants and bars. 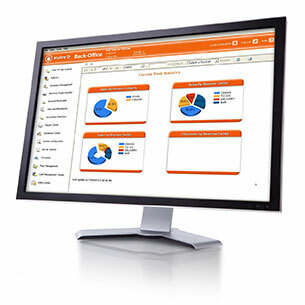 Maitre’D software offers a complete back-office solution for easy management of one or more businesses. Various modules and interfaces are available to help better control the costs and operations related to the management of restaurants and bars and thus increase their revenues. A mobile application (IOS and Android) is also available with Master’D to offer real-time information about sales, discounts, cancellations, labor costs and more. With its SQL database, Maitre’D point of sale software can easily enable the development and integration of customizable interfaces to fit the specific needs of restaurants and bars. The platform is secure and reliable, so the information remains protected. Maitre’D software complies with PCI security standards. Moreover, it is attested MEV (module of registration of sales for restaurants and bars). Maitre’D can also be used in a mobile way, enabling real-time monitoring of software management on the smartphone (iPhone and Android). Moreover, the mobility ensures increased speed and efficiency, by taking orders at the tables. Mobility: Innovation and efficiency for restaurants and bars. With its Master’D solution, NEOPOS is positioning itself as a pioneer in the field of mobile sales outlets for taking orders at the table in the restaurant sector in Quebec. This point-of-sale (POS) solution is definitely a must for restaurants and bars and has a positive impact on your profits. In short, by adding Maitre’D mobile sales outlets, you will ensure a faster service, as well as lower losses and an increase in the performance of your business. The customer experience will be improved! Reports to drill data into CSV, PDF, Word, and more. With Maitre’D’s Databoard, access a wealth of real-time information directly on your cell phone or tablet. Quickly learn the pulse of your operations and make sure you are informed to optimize your decision making for your bar or restaurant. Maitre’D offers a complete kitchen control screen solution. This solution allows the management of functionalities for kitchen orders. The back office can send a message to the screens. The tip sharing software is used with the Maitre’D timestamp. Ideal for restaurants and bars that distribute tips in proportion to the hours worked. Can be exported to payroll software like Employer D, Ceridian and ADP. Have a custom mobile app option. Easily take a bank deposit. Allows you to put advertising and promotions on the order screen. The Master’D POS software is also designed for fast service countertop environments. The electronic display screens display your menus and prices according to the time and the day. Show promotional videos and images of your products, all integrated into Maitre’D that allows you to change prices in one place! Avoid changing prices and items during the day. The database of Maitre’D POS software being SQL, it allows us easily to offer several types of integration to meet the needs of our customers. The Sales Recording Module (SRM) is the device selected by Revenue Québec to implement its technological solution in the hospitality industry. Now compulsory, the SRM provides the government with essential sales information. This module is installed directly on your POS solution or on your cash register and is very easy to use. Connected to a point-of-sale system or a cash register, the SRM allows you to send data relating to your commercial transactions. It also records securely the various transactions, such as sales and taxes, and transmits the necessary information for printing the invoice. For the restaurant and bar sectors, the combination of the Maitre’D point-of-sale solution and the Berg drink control system is by far the simplest and most efficient solution for mandatory SRM billing. All the products offered by NEOPOS are compatible with the SRM.